After feeding all of the animals during Home Crew yesterday, I observed this rather feisty Dungeness Crab lifting up a Leather Star to get to the clams that had just been fed to the star. Another crab and a flatfish also came over to see what the Dungeness was up to. Check out these videos to see how it all played out! 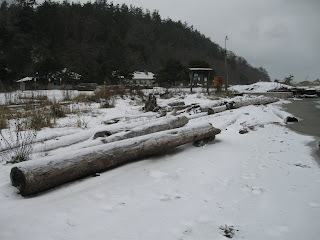 View from the beach in Fort Worden State Park. 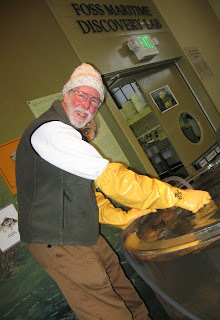 With a high predicted of 29 degrees Fahrenheit today, our dedicated "home crew" volunteers showed up despite the plethora of snow and below freezing temperatures to clean the tanks and feed the animals in the Marine Exhibit. 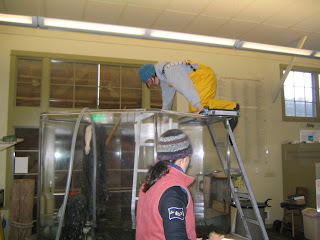 Liza had to spend 20 minutes this morning unfreezing the lock on the outside of our building! 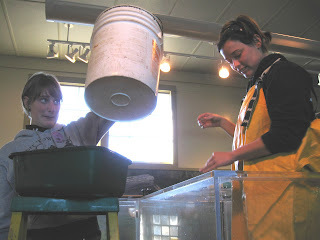 Thursday volunteers consist of 4-5 regulars and are sometimes joined by others who choose to volunteer for the day. 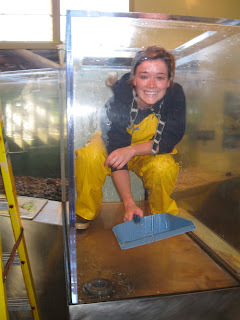 Week after week our "home crew" volunteers show up to roll their sleeves up, get dirty and find satisfaction in cleaning and caring for the animals in our tanks. Once you get the tricks of the trade down, cleaning can become fun and even satisfying as the monotony and meticulous nature of the work engulfs your thoughts and lets you "escape" for two hours. We would never be able to function, yet alone facilitate everything we do, without the generous support from our volunteers who are more than willing to help in any way possible. Thank you for your hard work and dedication. We love you for it! 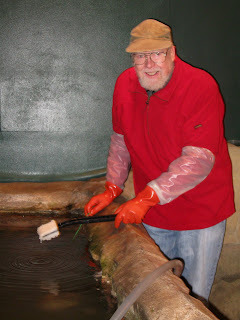 Bill cleaning the round tank like a trooper. 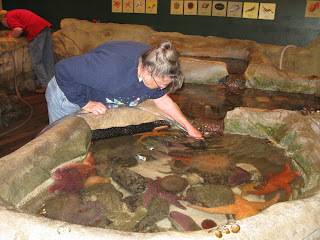 Betty cleaning shells out of Touch Tank Two. Betty can tell you how to keep your gloves looking nice and new! 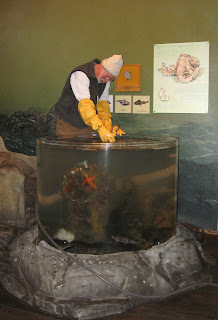 Sandy siphoning Touch Tank 3. 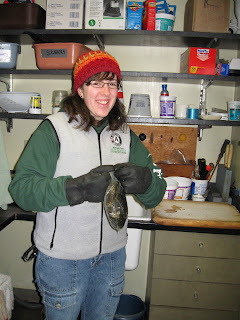 I can't imagine how Sandy managed to do this without gloves on in this cold weather! Joe doing what he does best. Liza prepping the food to feed to the animals. Winter has officially set in now that the piling tank has been taken down. 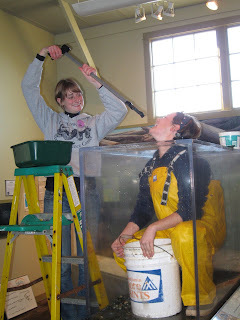 I spent the later part of this week removing all sorts of critters from the tank, cleaning the pilings and scrubbing the acrylic tank. 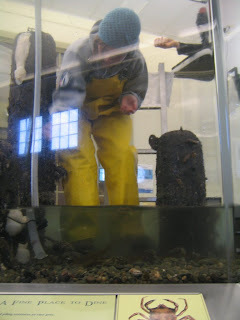 The kelp crabs in the piling tank were released off our lower dock back into the kelp beds. 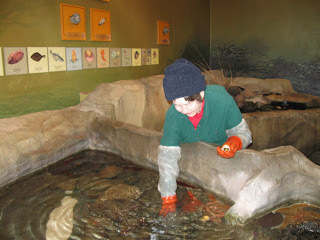 All of the fish found temporary homes in other tanks. 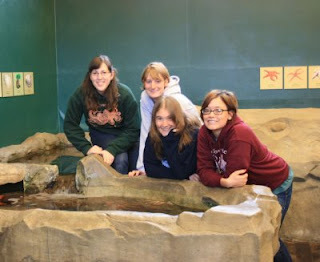 Some of you may remember the 1 legged kelp crab in our hospital tank. I'm sorry to report that he died while trying to molt last week. After months and months of being hand fed, the small crab began molting. At first I was ecstatic to see his new appendages and hopeful that we would be able to put him back in one of the exhibit tanks. Sadly, the juvenile crab must have had trouble backing out of his carapace. 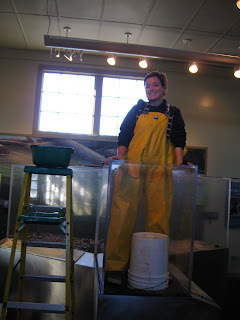 Cheqa, our high school intern, and I gave him a truly heroic burial as we threw him down the hatch to return to the sea. Local news coverage on KOMO mentioned the Salish Sea Hydrophone Network I wrote about in the last post. They compare two of the hydrophones and acknowledge that boat noise in our waters can have a detrimental effect on the endangered Southern Resident orca population. Click here to view the short video on KOMO's website or here for a text version. Speaking of last post, we weren't the only ones watching the orcas pass through. 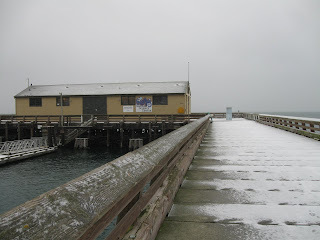 Howard Garrett of Orca Network on Whidbey Island was on the water identifying the orcas. 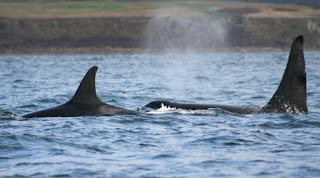 He took this great picture of J1 (right), known as Ruffles, and K12 (left), known as Sequim.